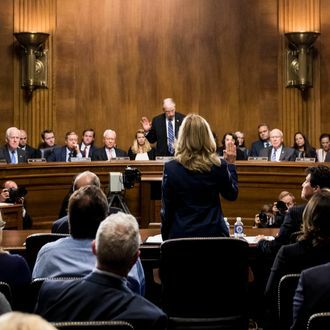 Live coverage of the Senate Judiciary Committee hearing about Dr. Christine Blasey Ford’s sexual-assault allegations against Judge Brett Kavanaugh boosted cable news ratings well above average Thursday, with Fox News dominating its two main rivals. Per Nielsen, about 13.1 million viewers watched Kavanaugh’s afternoon to early evening testimony between 3:15 and 6:45 p.m. ET, while 9.8 million tuned in for Ford’s earlier appearance from 10:30 a.m. until 2:15 p.m., during which she alleged that Kavanaugh sexually assaulted her in high school. All three networks surged well above their usual audience levels because of the Senate hearing: CNN and MSNBC doubled their daytime averages compared to Wednesday, while Fox News tripled its day-earlier average. Fox’s advantage was most evident during Kavanaugh’s testimony, when the network’s audience of 7.2 million viewers beat the combined ratings for MSNBC (3.2 million) and CNN (2.8 million). Fox News was also first in the key news demo of adults under 55, with CNN beating MSNBC for second place. MSNBC said it had its biggest daytime audience ever. Full numbers for all TV coverage, including broadcast and cable news networks, won’t be available until next week. But Nielsen says 20.4 million adult viewers, on average, watched the full daylong hearing via the three major cable news networks and ABC, CBS, and NBC. Nielsen didn’t break out how Kavanaugh and Ford did individually or how each broadcast network fared. Meanwhile, back on cable news, the surge of Kavanaugh coverage spilled into prime time, long after his testimony wrapped. Rachel Maddow drew 4 million viewers at 9 p.m., her show’s second largest audience ever, though that was dwarfed by Fox News, which notched 5.5 million viewers in prime time. At 9 p.m., Sean Hannity’s broadcast — featuring a guest appearance by Republican senator Lindsey Graham — averaged 5.8 million viewers, beating NBC’s season premiere of Law & Order: SVU. And at 10 p.m., Fox News host Laura Ingraham was seen by 5.4 million viewers, beating out broadcast competitors SVU, How to Get Away With Murder, and S.W.A.T.